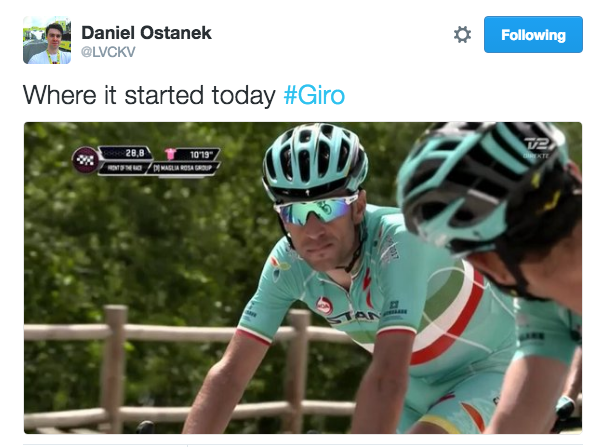 It’s been a long time since we’ve seen a Grand Tour’s top step be decided on the penultimate stage but we saw it today. With a short (134km) stage that was climbing and descending from the very start and the top 4 spots of the GC so close, it was a day of reckoning. In the end, Rein Taaramae (Katusha) took a solo stage win and Vincenzo Nibali (Astana) took the maglia rosa and this year’s Giro. There are so many great performances in this stage, it’s hard to pick a rider of the race but it’s impossible not to pick that rider to be Vincenzo Nibali. From blowing on the final climb of Stage 16 and losing a minute to be down 4.43 on the GC to riding an imperious race yesterday to make up all but 44sec of that time, His Nibs has had the full spectrum of performance this week. Today, a combination of super team tactics and still strong legs meant that he could drop race leader Esteban Chaves and effectively win the Giro today. Bar anything untoward happening, he will be showered with pink confetti while holding the Giro trophy tomorrow afternoon in Torino. Rein Taaramae took a fine solo stage victory today, in honour of his Katusha teammate Ilnur Zakarin, who had that terrible crash yesterday and had to leave the race. Taaramae had been in the break for most of the day, yo-yoing between the front and chasing groups along the mountains, until he finally made his break 3km from the summit of Colle della Lombarda, freeing himself from the ever-present, ever-tenacious Darwin Atapuma (BMC) and Joe Dombrowski (Cannondale). Steven Kruijswijk rode today with a broken rib and he still finished fourth overall, although he did lose his place on the podium to Alejandro Valverde. Do you know how hard it is to breathe properly with a broken rib? Chapeau. 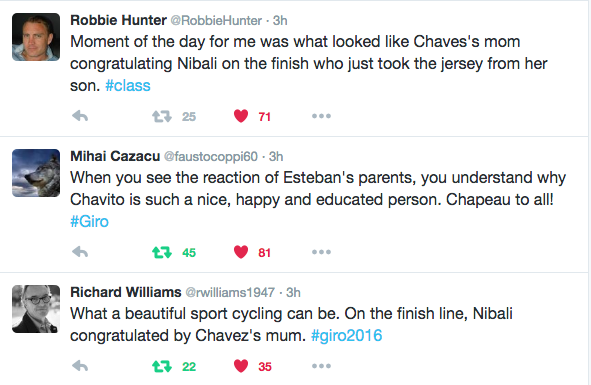 Esteban Chaves’ parents travelled from Colombia to be at the finish line of today’s stage. 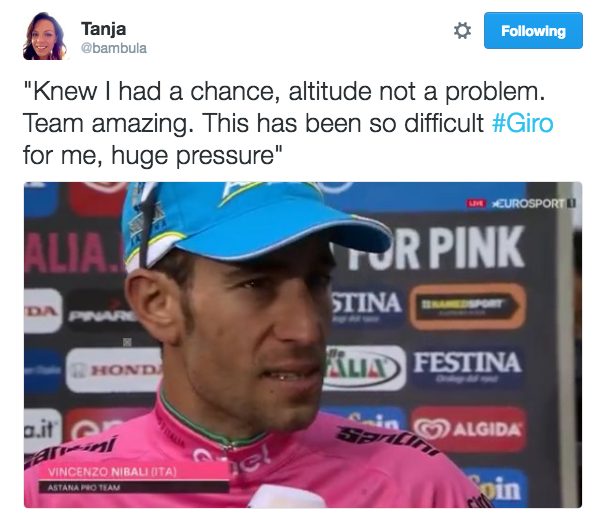 When Vincenzo Nibali crossed the line, sealing the fate of her son’s loss of the maglia rosa, Chaves’ mother went over to congratulate Nibali. That is pure class. As Chaves was crossing the finish line with Scarponi, knowing he had lost the maglia rosa, Scarponi punched the air in victory. Seriously, dude, you could have waited a few minutes – gloating is utterly #unclass. Tomorrow, Adam Hansen will most likely finish his 14th consecutive grand tour. And he had some fun today.